Due to be published online this summer are further editions of the Craigleith Chronicle, a hospital magazine produced by staff and patients of Craigleith Military Hospital during World War I. As a taster of one of the editions, part of an article by CW Cathcart from September 1915 is presented this week (LHSA ref GD1/82/8). In it he explains how the operating theatre was developed when the hospital was converted from the poorhouse. Due to the war, the facility needed to have all of the equipment supplied locally. The problem of supplying sterilised water was one which was overcome by a number of interesting solutions. Two forty gallon water tanks designed for domestic purposes were obtained, where water could be sterilised by boiling before being used for operations. One of these had a coiled cold water pipe run through it so that the water could be chilled to provide cold sterile water. 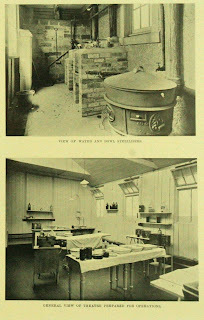 A high-pressure steriliser was donated by the Edinburgh Royal Maternity Hospital staff who said they could make do with an old steriliser in the meantime and a cast iron cattle trough (presumably new) was converted into a boiling basin by fitting it with an exit tap and a cover! 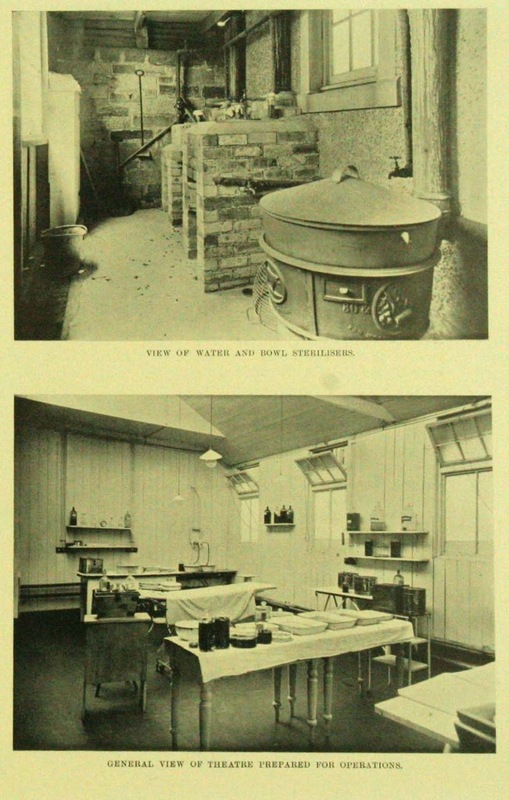 The images from the magazine show the water and bowl sterilisers, and a general view of the operating theatre. Adjoining rooms were converted to create an X-ray department, an anaesthetic room, a sterilising room, a room for applying dressings and a dental room. The article states that between the end of August 1914 and mid July 1915, the theatre and dental room were used for 1,792 surgical and 1,324 dental operations, however these procedures were for the most part carried out to ‘fit recruits and Territorial soldiers for active service abroad’. This suggests that the health of young men in the Lothians was not great at the time. Cathcart concludes by thanking the theatre sister for her efficient service during his time in Craigleith, reminding us that carrying out operations was a team effort. Taking part in the Preservation Advisory Centre’s ‘Essential Preservation’ course yesterday was a great opportunity to share LHSA’s experience of collection care with others new to the sector. We led a couple of sessions focusing on handling special collections and looking at the conditions that rare material should be stored in. 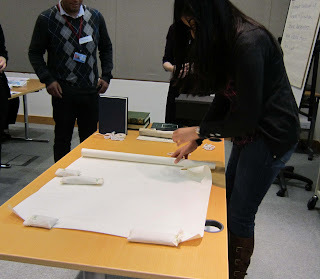 A hands-on handling exercise proved to be particularly useful for attendees, having a go at carefully rolling and unrolling a damaged architectural plan (well, a piece of plain paper cut to the size of a plan and torn in a few places to simulate the real thing!). 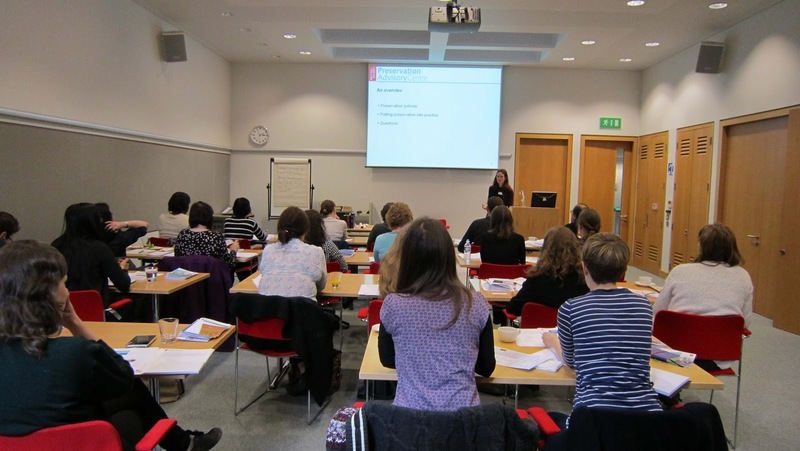 But it wasn’t just a chance for us to help other archivists in the public sector get to grips with preserving their collections for the long-term, there was lots to be learnt from the other speakers too. One of the British Library’s preventive conservators talked about the development of their disaster plan and the Head of the Preservation Advisory Centre described various ways to communicate preservation issues to colleagues to get them involved in caring for the collection, so there were lots of top tips and great ideas to be had! Time is certainly moving on quickly in LHSA’s Norman Dott case note cataloguing project. With the first case note series catalogued (relating to Dott’s early hospital and private practice), I’ve now moved on to the largest series of over 22,000 records documenting Dott’s work at the Royal Infirmary of Edinburgh from the 1940s. But at the end of the first, early series something unexpected awaited me. Labelled ‘Spina Bifida Cases’, a final box contained collected summaries of spina bifida cases in children under two. Not only does this box contain a number of glass plate negatives, lantern slides and related photographs (exciting finds in themselves! ), but the earliest of these patient records is dated 1922, making it the oldest in the collection to date. Spina bifida is a fault in the development of the spine and spinal cord during a baby’s growth in the womb. 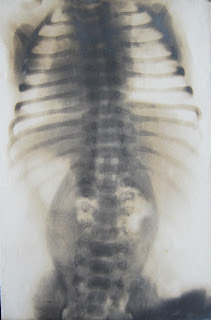 In its most common form, the spinal column does not fully close, causing membranes and the spinal cord to push out to form a sac on the back of the baby (a meningomyelocele). 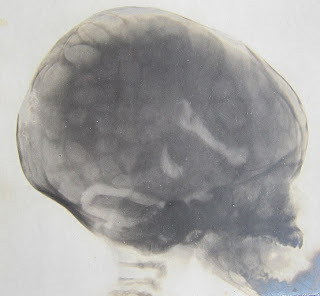 Babies born with spina bifida are also at risk from hydrocephalus (excess cerebrospinal fluid in the brain), which was probably why Dott was keen to examine their heads as well as their spines. The spina bifida case notes are records of encephalography, a now-outdated x-ray procedure through which cerebrospinal fluid was removed from the ventricles in the brain or the spinal cord and replaced with oxygen, allowing a clear image to be taken. Along with these images are notes describing the procedures and the implications of the x-ray findings. Notably, these young patients were under Sir John Fraser (1885-1947, and pictured in last week's blog), with whom Dott published on paediatrics in the early 1920s. Fraser served as surgeon to the Edinburgh Royal Hospital for Sick Children (R.H.S.C) from 1920 to 1925, eventually attaining the prestigious Chair of Clinical Surgery at the University of Edinburgh. Dott showed a considerable interest in spina bifida cases and paediatric surgery throughout his career, becoming Honorary Surgeon to the R.H.S.C in 1925. These photographic materials and notes relate to cases seen as out-patients at the R.H.S.C before Dott took up his official post there and, although Dott occupied a number of surgery and lectureships at various Edinburgh institutions before 1925, the R.H.S.C was not one of these. Although I’m very busy cataloguing at the moment, these ‘gaps’ in Dott’s career which are not documented by our case note collections will be exciting to research in the future, particularly using the collection of Norman Dott’s private papers held by LHSA’s colleagues in the Centre for Research Collections. We’ve had a busy period of activity on the accessions front, with a mixture of large and small accessions arriving from the NHS and from private hands. Here’s a selection of those related to psychiatry and mental health. 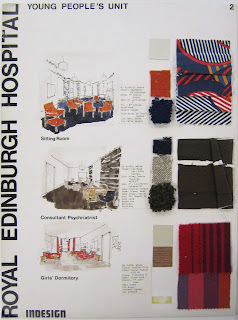 A fantastic set of designs for the Royal Edinburgh Hospital was received as part of the bicentenary archive appeal. 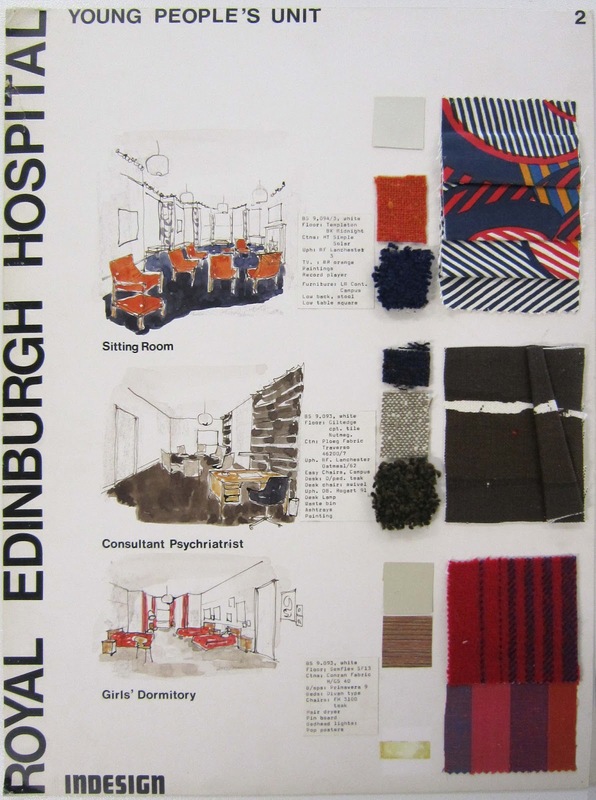 Created by interior designer Margaret Campbell in 1967, they include proposals for MacKinnon House, the Young People’s Unit, and the Doctors’ Residence. 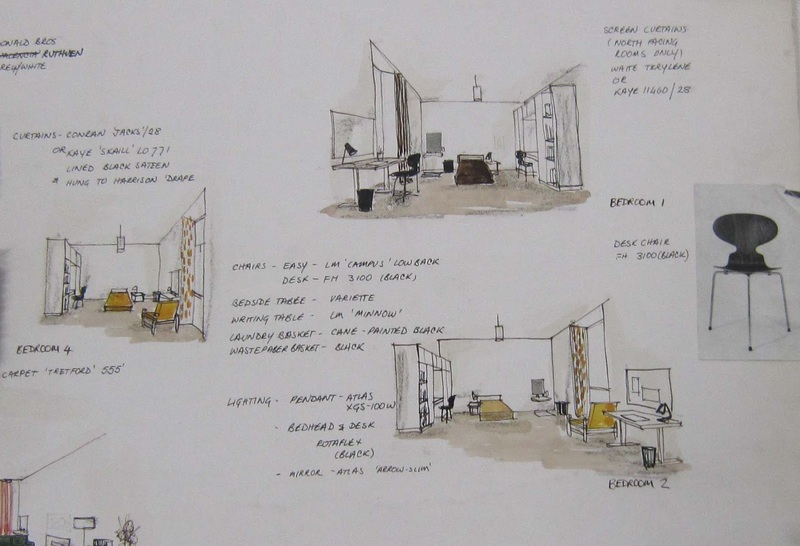 They are a celebration of 1960s fashions, and include test fabrics, colour blocks, slides and drawings. 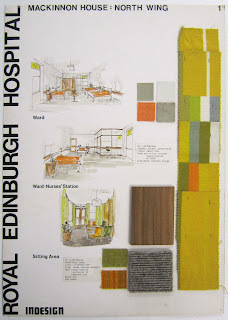 Our thanks go to Margaret for kindly donating her work to LHSA – we expect it will prove to be a great resource for anyone studying hospital design during this period. Last week, the Oor Mad History papers were transferred to the Archive to join the oral history recordings collected earlier on in the project. Together, they form a comprehensive record of the mental health service user movement in Edinburgh and the Lothians from the 1980s onwards, and we look forward to this being a heavily used collection. And finally, today, the Archivist will be sampling late-twentieth century psychiatric case notes from West Lothian. These records are considered likely to have long term archival value, but given the huge quantity of them, a random sample will be selected for transfer to the Archive whilst the remainder will be securely destroyed by the NHS Lothian Records Management team, since they are beyond their legal retention period and have no further administrative or clinical value. More information on this can be found in Annex B of the NHS Records Management Code of Practice can be found at: http://www.scotland.gov.uk/Publications/2012/01/10143104/0.